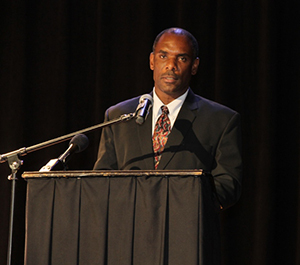 NIA CHARLESTOWN NEVIS (October 17, 2014) — Acting Permanent Secretary in the Ministry of Finance Colin Dore, says the island’s economy had begun to show signs of a turn around, after it was negatively affected by the global financial meltdown of 2008. “All economic indicators are now trending upward and there are encouraging signs in the key economic sector which forms the pillar of our economy. Expanded opportunities are therefore achievable in our quest to bring prosperity and equity for all. “As we ponder on the theme, we should now ask ourselves, “what is this expanded opportunity and how is it measured?” As an Administration, have we prepared the groundwork for this expanded opportunity,” he said. The Permanent Secretary went on to indicate that at the forefront of the expanded opportunity were five major requirements – Fiscal Expansion, Real Sector Growth, Job Creation, Debt Sustainability and Statistical Data Revolution. In the area of Fiscal Expansion, he explained what was required. “Fiscal expansion results directly from our ability to generate increasing government revenues through increased economic activities. This expanded opportunity for prosperity is already positively impacting our revenue collections over the past two to three years. “In 2012 total government recurrent revenues amounted to $116.5 million, increasing to $121.6 million in 2013, an increase of 4.3 percent and for the first half of 2014 it stood at $62.0 million. This revenue performance to date, indicates that revenue for 2014 should exceed that which was achieved in 2013,” he said. For Real Sector Growth, Dore explained it was an area that touched the island’s Gross Domestic Product. “Growth in the real sectors will most definitely affect our Gross Domestic Product (GDP). Our level of sustained growth will most definitely be determined by our regional and international partners, as our economy is service oriented import driven. It was interesting to note that at our last International Monetary Fund review, our economy was set to achieve a growth rate of 3.4 percent in 2014 doubling the initial projection of 1.7 percent. “In this thrust for expanded opportunities, the key question must be “how is our economy measuring up against our regional partners? Are we keeping pace with their projected level of growth? Closer home, at the Organization of Eastern Caribbean States level, there is an expectation that real economic growth will average three percent among member countries in 2015 moving to five percent thereafter,” he said. Dore added that based on analysis in the Regional Economic Outlook issued in April 2014, it showed that growth in the Nevis economy has outpaced the regional and international averages. In the area of Job Creation, the Permanent Secretary noted that it was a matter at the heart of every successful economy and the Ministry of Finance was mindful of its role in creating the necessary climate through concession and incentives programmes to achieve that. However, the question was whether the economy was creating jobs and if so, at what pace? Dore outlined the areas which had provided avenues for job creation. “Job creation can result either from expansion in existing businesses or the establishment of new business ventures. While there are no exact means of measuring the level of job creation, the available data showed that in 2012, the Ministry of Finance approved 131 new business licenses in various sectors of the economy. This increased to 203 in 2013, an increase of 55.0 percent and for the first nine months of 2014, a total of 161 new business licenses were approved. “If we are to be very conservative and assume that on average, each approved business license creates one new job, then it will be fair to conclude that almost 500 new jobs were created over the past three years,” he said. The Permanent Secretary added that the local office of the St. Christopher and Nevis Social Security Board’s statistics supports the NIA’s job creation figures. “The employment numbers from our local Social Security office also provides support to this, as the average employment in 2012 stood at 4966, increasing to 5362 in 2013 and so far in 2014, is continuing to hold steady in the first half of the year. “A number of these jobs are in the self-employed category and this would explain the variation between the rate of new job opportunities and that of average employment rate from the Social Security report,” he said. According to Dore, Construction remained a key area which supported job creation. “The construction sector continues to be robust and showing signs of steady growth resulting mainly from the first-time homeowner programme and the flow of foreign direct investment through the Citizenship by Investment projects. “The wholesale and retail trades and the hotel and restaurant sectors are also showing signs of rapid growth in employment,” he said. In the area of Debt Management, Dore told stakeholders at the Consultation that realising controllable levels of debt was important. “Achieving manageable levels of debt sustainability is critical if we are to provide this expanded opportunity. The ideal level of debt to GDP ratio is 60 percent. As a small country with high levels of indebtedness, how do we achieve this benchmark? Do we have the resources to do so and are we committed to making small steps towards achieving this goal? These are questions that we can deliberate on today,” he said. Regarding Statistical Data Revolution, the Permanent Secretary asked those present to ponder on important questions related to statistical data. “Yesterday we joined with our CARICOM partners in observing World Statistics Day 2014, with the aim of building awareness to the need for statistical data, under the theme “Data Revolution for Sustainable Development. “Can we truly boast of expanded opportunity without a meaningful way of measuring this? How reliable, how timely, how accurate is our statistical data? Are we fully utilizing the available data for effective business decision both in the public and private sectors? As an Administration, how can we improve our data reporting for effective decision making? These are questions that I am hoping will also occupy our minds today,” he said.